Here is another delicious recipe by Tupperware! 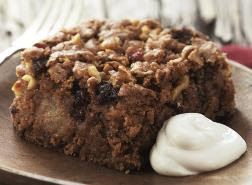 This recipe is for the Cranberry Apple Pomegranate Snack Cake...which is a great cake to make for parties, summer entertaining and family get togethers. Preheat oven to 350°F/175°C. Toss drained apple slices and cranberries with Simple Indulgence™ Cranberry- Pomegranate Dessert Blend in a Quick Shake® Container. In an ungreased, 8-inch square baking pan, mix flour, sugar, salt and chopped nuts with a fork. Stir in apple slices and oil with a Saucy Silicone Spatula until blended. Bake 35-37 minutes or until a toothpick inserted in center comes out clean. Remove from oven and cool slightly before cutting. Variation: Substitute whole wheat flour for self-rising flour, 1 tsp. baking soda and ½ cup low-calorie brown sugar baking blend for brown sugar and add ½ cup oatmeal. I love cranberries and cranberries and pomegranate with apple sounds totally divine.